Respected science fiction author-editors Gregory Benford and George Zebrowski present an anthology, with unique color illustrations, that is filled with the excitement, poetry, and adventure awaiting us in the limitless final frontier that is the sky. For years, science fiction has portrayed humankind growing away from the cradle of Earth through spacecraft, space stations, and space homes. 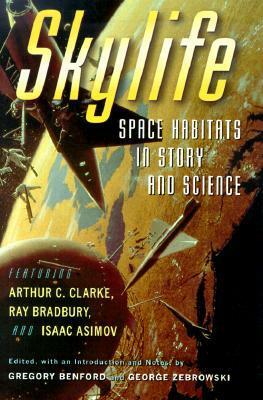 Skylife features stories by such masters of science fiction as Arthur C. Clarke, Isaac Asimov, Ray Bradbury, Larry Niven, Joan Vinge, and James Blish-in addition to several essays by scientists-all of which come together in one spectacular volume to provide a picture of our possible future beyond Earth.